The time period covered in The Hidden Treasure of Dutch Buffalo Creek is filled with many historical events. This page highlights some of the magazines that serve as inspiration for one of the chapters. They broaden the search for the meaning of the bayonet into the twentieth century. The current eBook represents a fit-to-screen rendering of the text. Plans are to release a Digital Resources Enriched eBook (DREeB) version in the future. It will contain hyperlinks to images of resources originally stored in the den overlooking the Dutch Buffalo Creek. They bring another perspective to the work. Examples are provided below. Periodicals about the time leading up to the war, the conflict, and the aftermath lined the shelf below. Arranged chronologically, the first was a magazine, News-Week Vol. IV, No. 25, December 22, 1934. It featured a headline that said, “Don’t Block Italian Expansion.” The message was reinforced by a photo of a dictator astride a tank. Another News-Week Vol. II No. 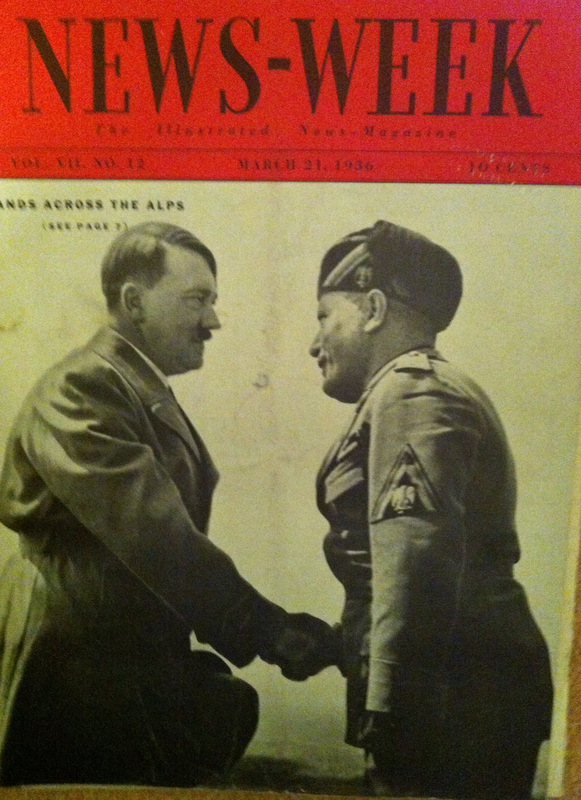 12, March 21, 1936 headline read, “Hands Across the Alps.” The cover photo portrayed that dictator clasping the right glove arm of his German protégé, ruler of the Third Reich. Two months later, German tanks breached the border, and soon most of Europe was involved. Subsequent issues chronicled the changing political boundaries. Hyperlinks that might be inserted on pages 46 and 47 of the current eBook to create a DREeB version.Perhaps the last significant bayonet charge was ordered during World War II. These magazines were among those discovered by James in the den overlooking the Dutch Buffalo Creek. 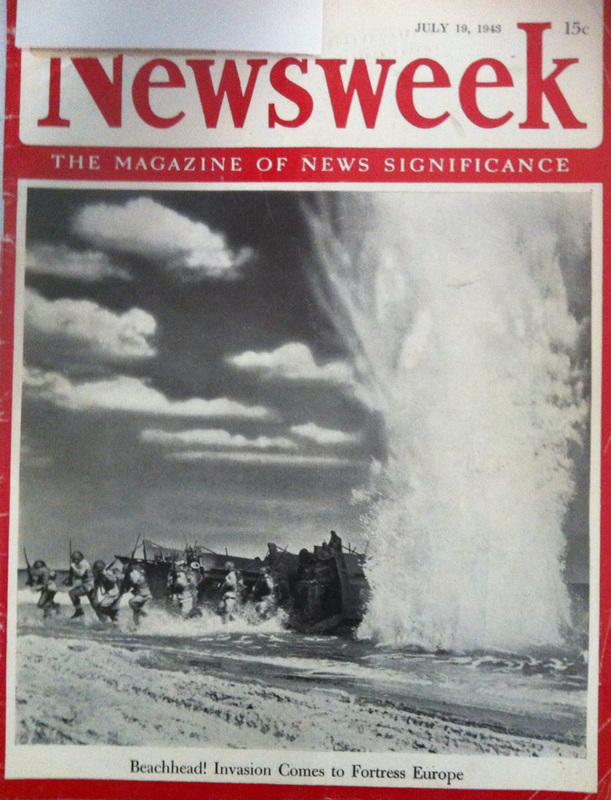 On December 14, 1942, Newsweek published a cover story titled “America at War; The First Year.” It featured a photo of a determined and optimistic US president pointing to a map of the Pacific as it appeared a year and a week after the attack on Pearl Harbor. 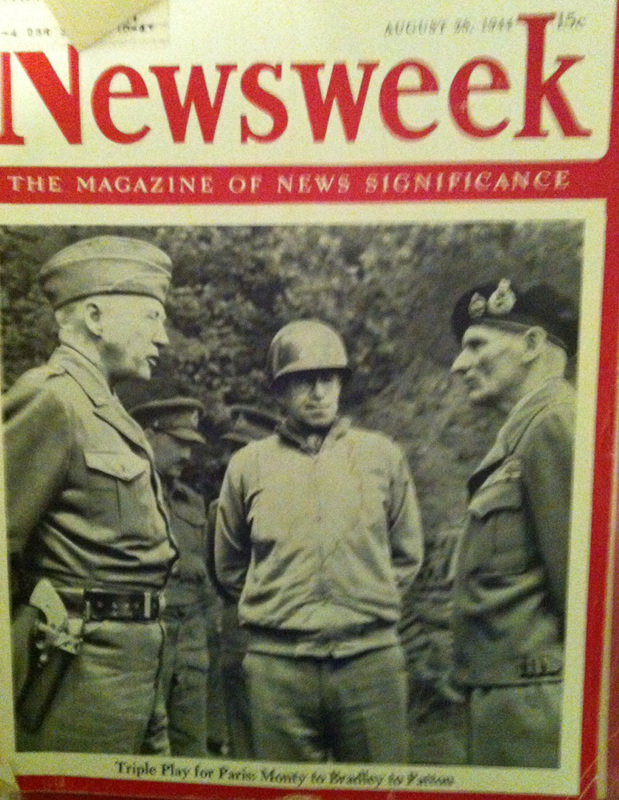 The August 28, 1944 issue proclaimed more good news: “Triple Play for Paris, Monty to Bradley to Patton.” A picture of three victorious allied generals graced that cover. By May of the following year it was finished in that theater of war. There was no headline, just the photo of a German soldier. His arms reached skyward in a gesture of surrender. 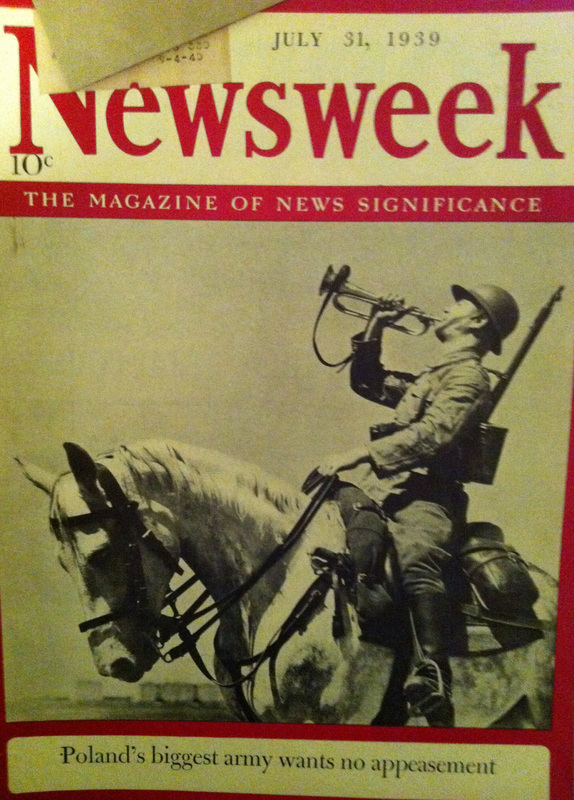 He appeared on the May 7, 1945 issue of Newsweek. Jackson, still without discernible form, fell silent. James imagined that he saw her shadow reflected upon glass that preserved a picture. It hung near the hall banister that joined the parlor and the den. It was a photo of the US Army Transport, Edmund B. Alexander. 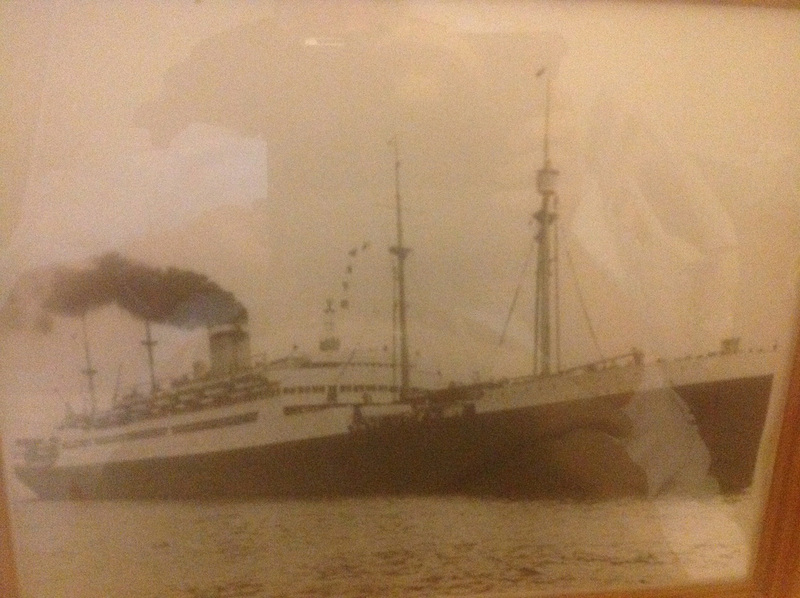 The ship carried James and his family to a new life following the aftermath of the Second World War. Hyperlink that might be inserted on page 30 of the current eBook to create a DREeB version. Five decades and six years after his cousin’s farewell, the Belgian walking cane cast a shadow on the most recent high water markers of Dutch Buffalo Creek. This time, Jackson encouraged him to document the event as a video. It joined a growing digital collection housed on Tumblr, Vimeo, and YouTube. He considered ways to preserve all the source material along with the computer external hard drive where he stored his digital archives. Passage as it might appear in a yet-to-be published DREeB - reference page 40, in the current eBook. He woke up to the sound of Mimi’s voice and the aroma of a fresh-brewed pot of coffee. It was 2014. Trav was back in the land of the living during the year of reflection and reconciliation. Nav opened the door. The room appeared to be normal again. All the artifacts were back in their appropriate place. Jackson joined KN as he tried to explain the experience to his wife. They returned to the creek. It acquired a new dimension during the several weeks that passed since the time that James posted a video to Jackson’s cloud. Passage as it might appear in a yet-to-be published DREeB - reference page 505 in the current eBook. The following information is given in the thumbnails above. I have also included it in chronological order with the links for your reference. Jackson, still without discernible form, fell silent. James imagined that he saw her shadow reflected upon glass that preserved a picture. It hung near the hall banister that joined the parlor and the den. It was a photo of the US Army Transport, Edmund B. Alexander.